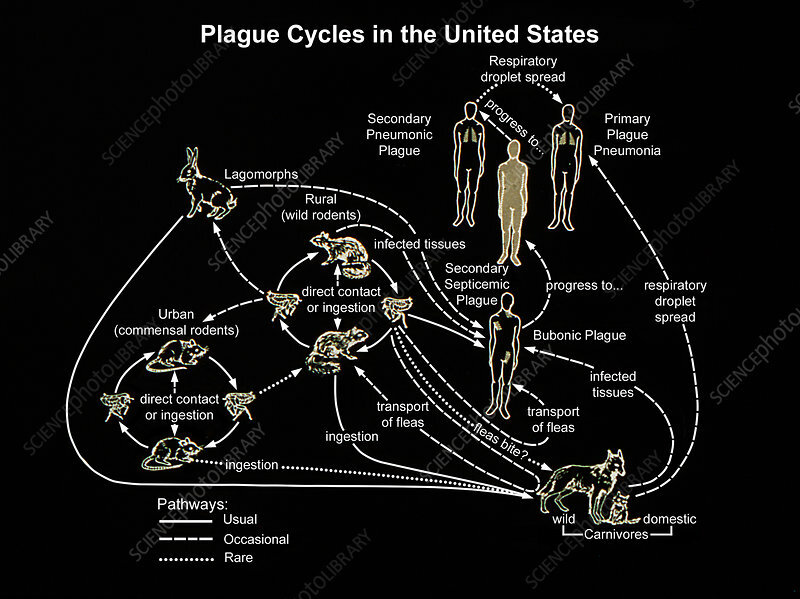 Modalities of transfer between various hosts of Yersinia pestis bacteria, which are the cause of bubonic plague in the United States. Plague may involve a wide variety of mammal species, including rodents, rabbits, wild and domestic carnivores, and humans. Many hosts, such as humans, carnivores, and perhaps rabbits, are considered to be dead-end hosts because the disease almost never passes from infected individuals to other members of the same population. Other mammalian species act as amplification hosts for Y. pestis, and once one animal within a population is infected, the likelihood is high that other animals within that population will also become infected. In some instances, Y. pestis apparently circulates within populations of certain rodent species causing very little overt disease or mortality. Among other species, such as prairie dogs and rock squirrels, widespread mortality occurs among infected animals.